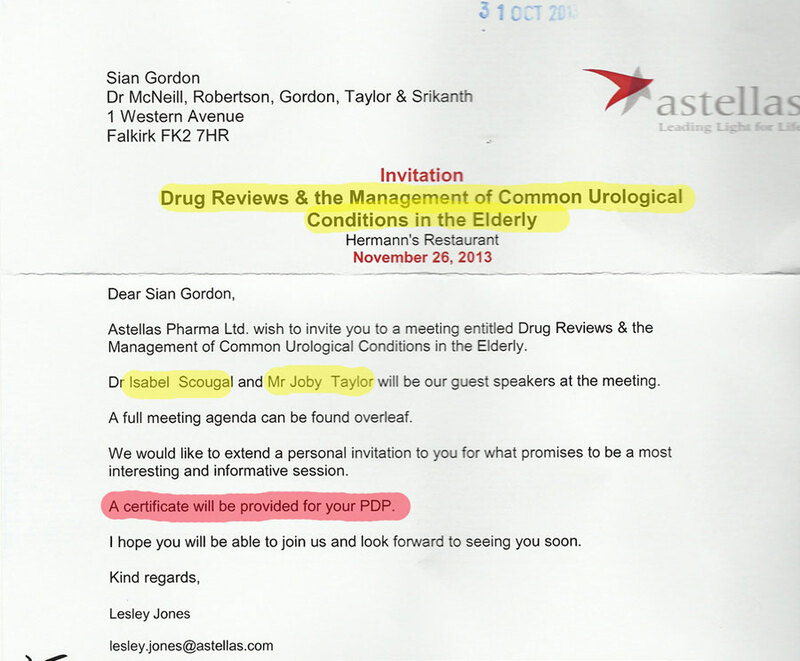 "This post is about medical education in NHS healthcare: this is called “Continuing Professional Development” (“CPD”). In this post I will explore the current relationship between medical education with commerce. The title of this post is taken from a quote by the current Director of Medical Education for NHS Forth Valley in a communication to me on this matter. As I get older I find that I see more patterns. The pattern in this post is not one of light. It is a dark pattern. A pattern not easily seen. Before trying to present light to this pattern, I want you to know that I am a scientist (as well as an artist) who supports innovation, scientific realism and progression. This is why the the Scottish physicist, and poet, James Clerk Maxwell has long been my guide. The pattern of images that follow (where I will try to keep my words spare) represent my very real concern that science today (and not just “in the past”) has rather too readily become the pocket of industry. 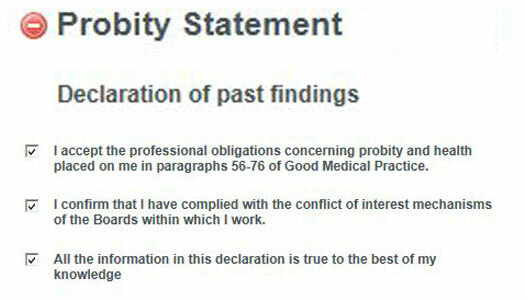 Even though not a doctor, after I wrote to him, Prof David Taylor submitted his declarations to whopaysthisdoctor.com . 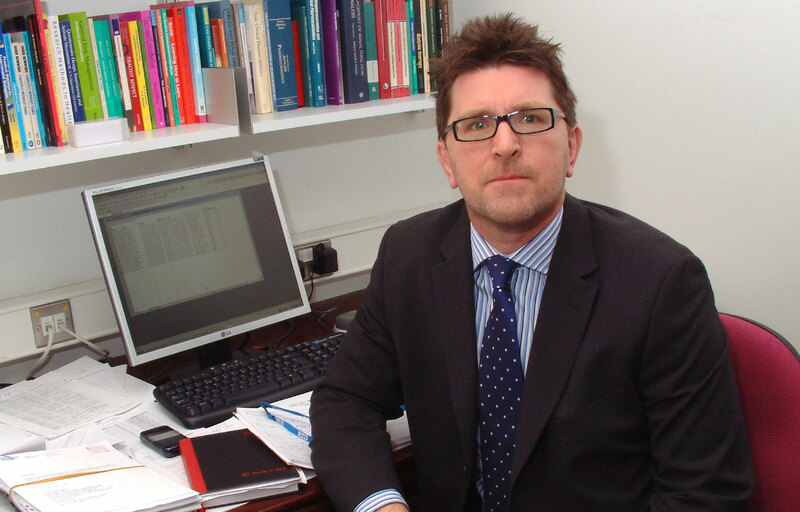 We should commend this openness, as here Professor Taylor is a leading example of openness. It is important however that we consider that in “offering” “education” Professor Taylor has significant financial under-writing. 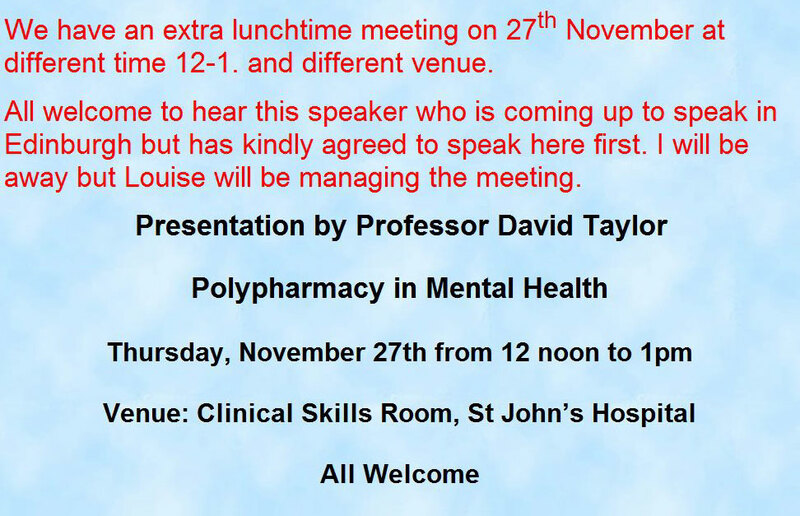 Professor Taylor has had a significant role in the development of UK-wide guidelines on prescribing in mental health. This year: The Director of Medical Education for NHS Forth Valley, said (25 February 2014) “Traditionally we have not registered the various meetings on the list as it was not required of us”. 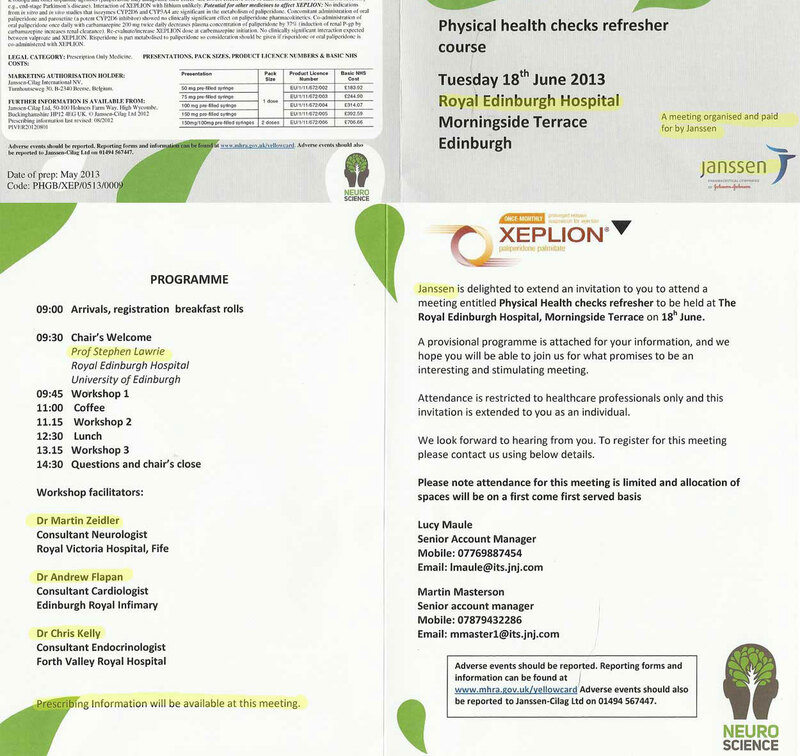 I will post some recent examples of sponsored education involving NHS Forth Valley employees. I do so without wishing to focus on any individual. 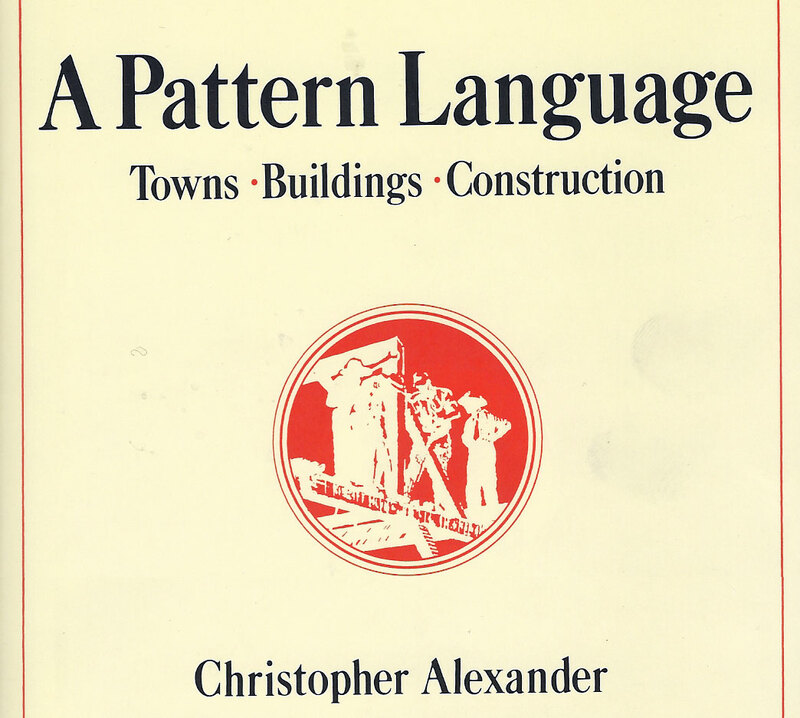 It is important that what I present is understood only as part of a wider pattern. It may be my error, but I cannot find any declarations made, by those potentially involved in any NHS Forth Valley Register. 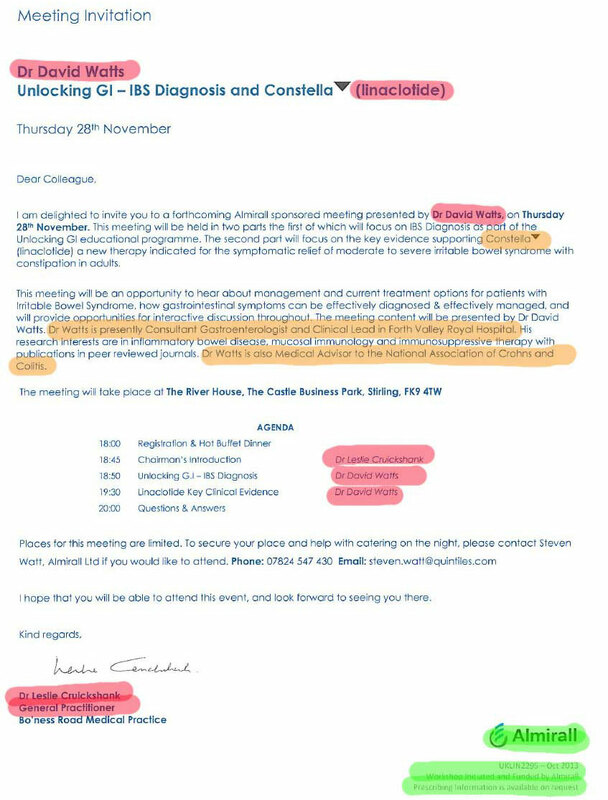 I wrote to the General Manager of NHS Forth Valley on the 20th March 2014, where I included ALL the following examples of employees involved in what would appear to be sponsored meetings. The pattern is broad. I have no doubt. 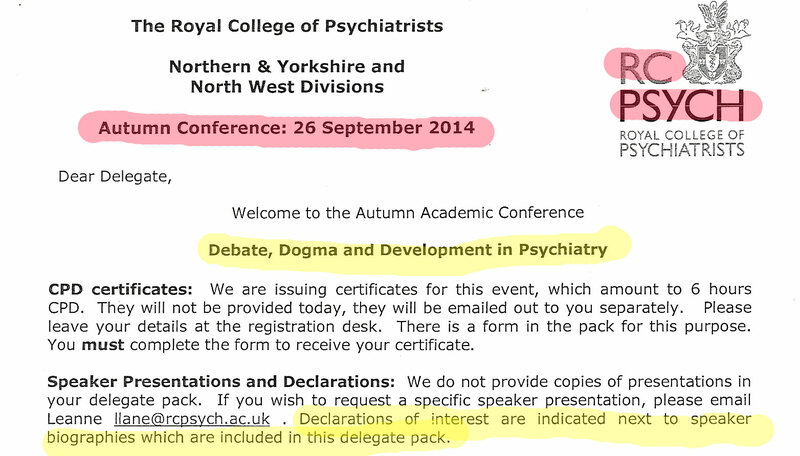 I recently debated with Professor Clive Ballard at a Royal College of Psychiatry Conference in Durham. 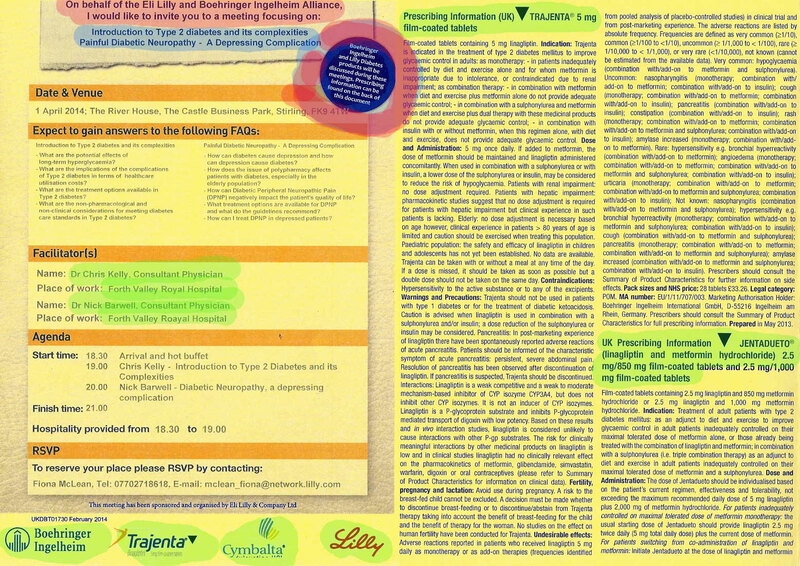 I suggested to the organisers, well in advance of the conference, that all those involved might consider that they declared any financial interests in the programme. The organisers agreed that this was a good suggestion. As it turned out I was the only one to declare that I had no financial interests. 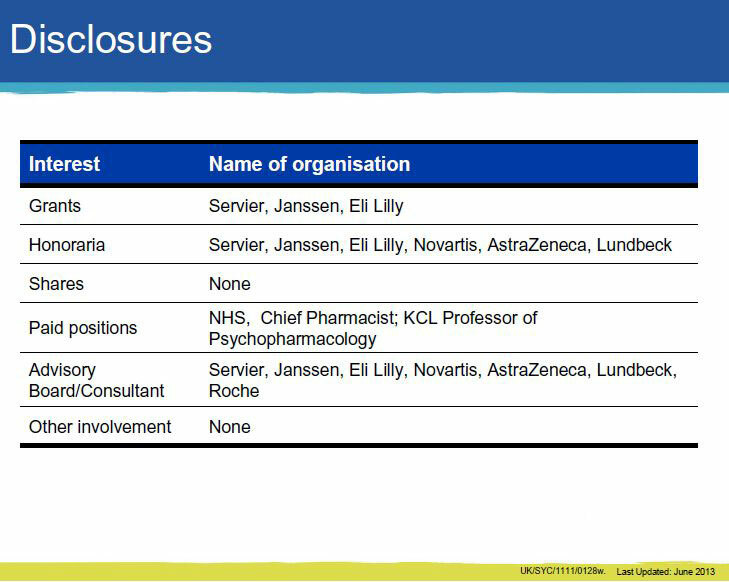 Professor Ballard chose not to reveal in the RCPsych programme, or in his presentation, any potential financial conflicts of interest. 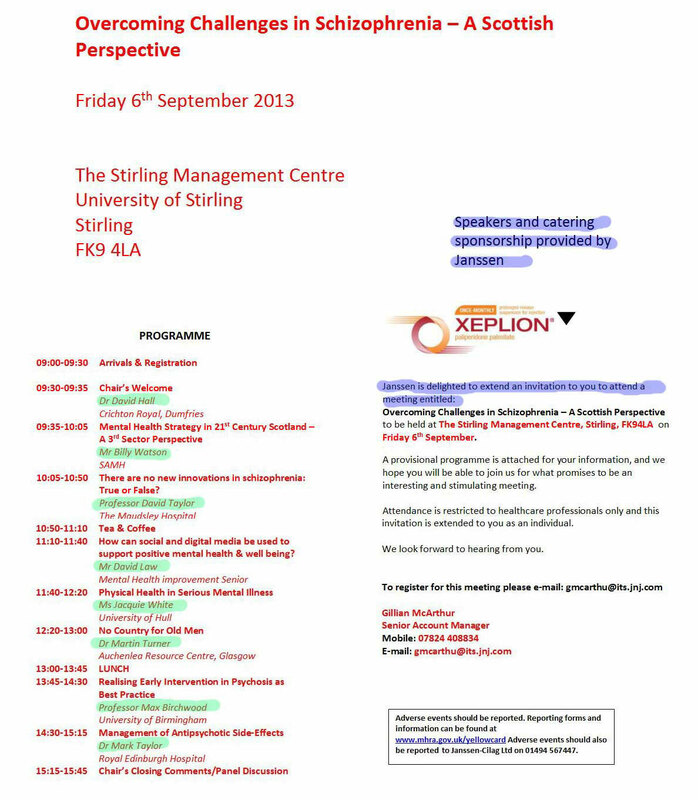 Another speaker at this RCPsych Conference was Prof Allan Young. 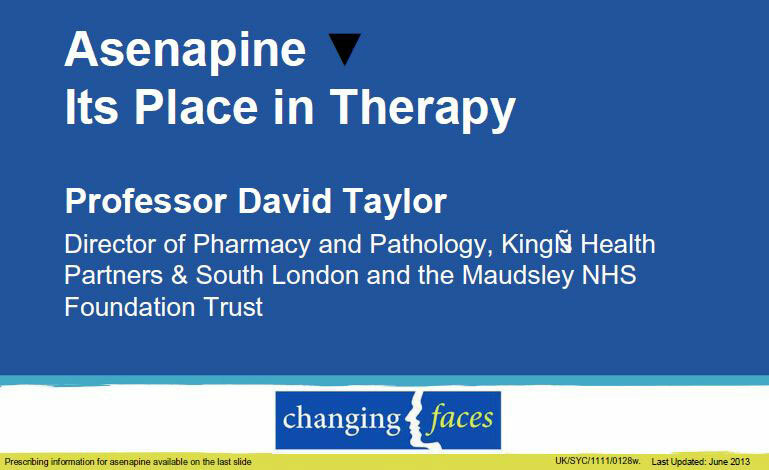 Like Professor David Taylor he had given hearty support to the promotion of Asenapine (my NHS email in-box was frequent witness to all of the promotions). At the RCPsych conference, where I was a fellow speaker, Professor Allan Young started out by mocking any need for transparency: “for those of you who watch panorama, I do not give my consent for you to film this”. 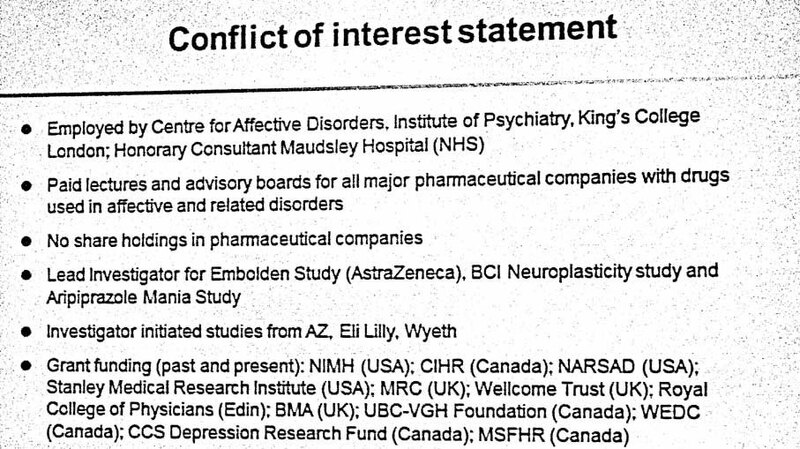 Professor Allan Young then presented his “Conflict of Interest Statement”. He did not talk his interests through (unlike the rest of his presentation) and my image is thus blurry (and “photo-shopped” to my best ability). Professor Allan Young presented his multiple financial interests in a blink of an eye but also fortunately in a camera click. In my camera click, I resisted Professor Allan Young’s wishes. Light is important to all patterns. 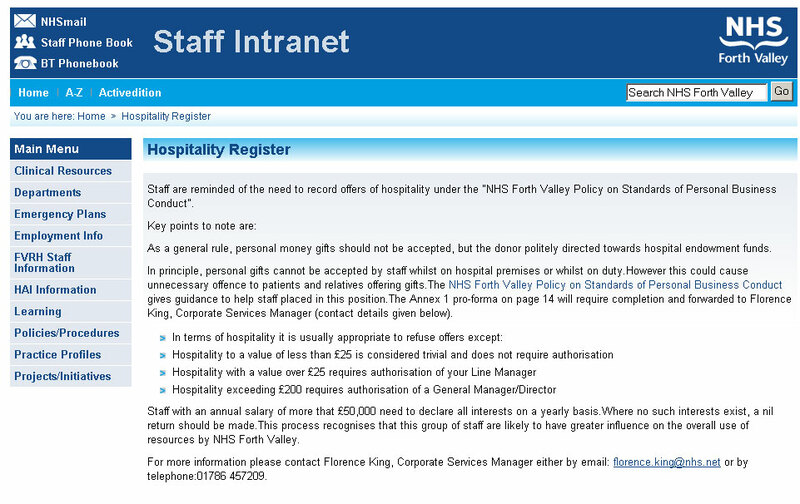 Following my advocacy, NHS Forth Valley, would seem to be the only NHS Board, out of Scotland’s twenty-two NHS Boards to have an open access register for all employees. From the evidence I have gathered it seems clear to me that Scottish Health Boards continue to fall very far short of complying with HDL 62. 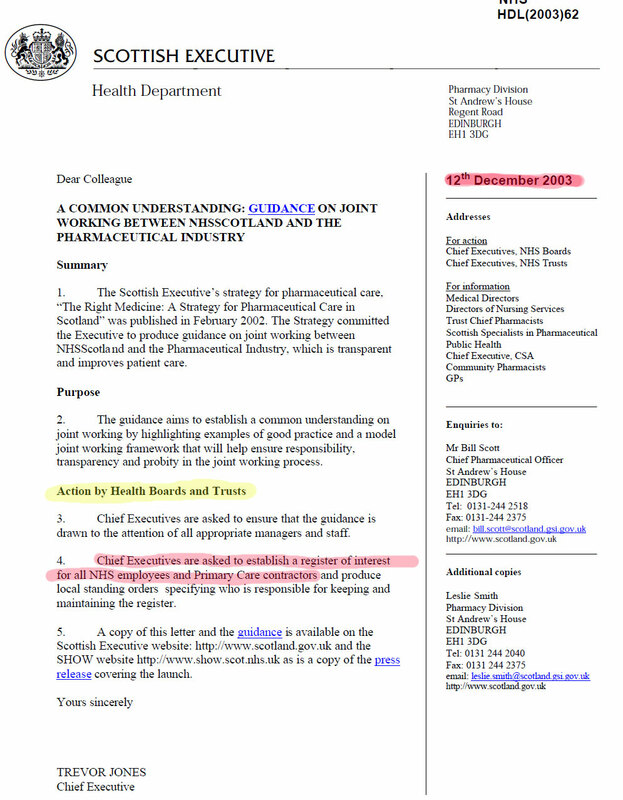 Yet this guidance delivered to ALL NHS Board Chief Executives is now 11 years old! It is for this reason that I submitted a petition to the Scottish Parliament suggesting that they might consider a Sunshine Act. Other countries have instituted such legislation. Like John Betjeman, I do not welcome bureaucracy, however a central, access to all register, enshrined-in-law, should be neither difficult nor burdensome to implement."